The future King pilots helicopter to pluck teen out of harm's way. 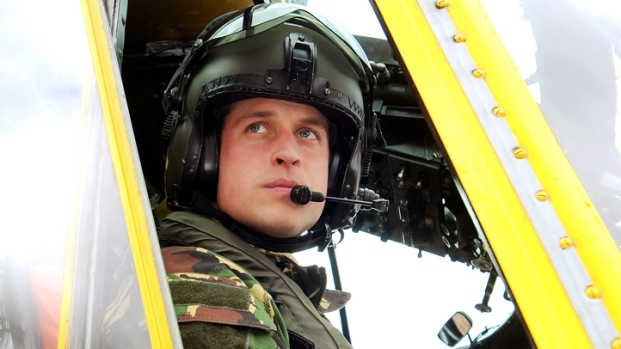 In this file photo Prince William is at the controls of a Sea King helicopter during a training exercise in north Wales. Sure, Prince William may look like a prince in military fatigues, but to one schoolgirl, he's really a knight in shining armor. The RAF search-and-rescue captain successfully piloted two girls, aged 13 and 16, to safety last night when they were left stranded off the Welsh coast. The elder teen girl was trying to help her younger sister when they got into some difficulties, and nearby surfers who spotted the duo quickly alerted authorities, thus cueing up the Wills-led rescue mission to pick up the pair. Kate Middleton's hubby, who carries out his heroics under the name Flight Lt. Wales, was on duty when the call came through and he and his crew quickly boarded the RAF Sea King helicopter and headed out to into Silver Bay, off the coast of Anglesey, where the distress call came in. The rescue was a success (when they got there, the 13-year-old was already safely back on shore) and while the girls seemed to suffer no more than some scrapes and bruises, the team still took the precaution of transporting them to a nearby hospital to get checked out. And, no doubt, to get over the double shock of not only being rescued, but being rescued by the future king of England. Wills qualified as an RAF pilot earlier this summer, and cut short his Olympics viewing schedule last week in order to get back to work. We can think of two people who are very, very happy about that decision.